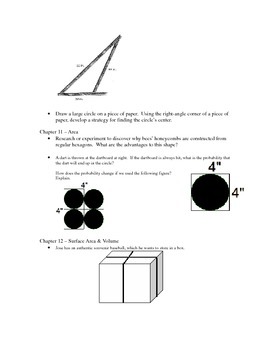 This file is a compilation of problems applicable to different topics in geometry that are set up to be used for "patient problem-solving" as seen in Dan Meyer's TED talk on the need for a math makeover. Therefore, these problems are lacking all of the necessary information for solving to allow students to brainstorm what they need to know first. They can be used in class and developed collaboratively, as Mr. Meyer suggests, or, as I used for my Honors-level students, as out-of-class, independently-chosen investigations. 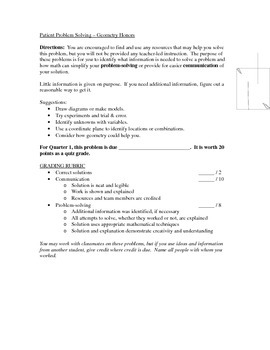 I have provided instructions and a grading rubric, if you intend to use them the same way (see the preview file). Topics include reasoning, congruent triangles, parallel lines & quadrilaterals, polygons, similarity, pythagorean theorem & trigonometry, circles, area, surface area & volume, and inequalities.